Your business was named a winner in our 2016 Best in Business Awards. A complete list of winners was published in the December 23, 2016 print edition of the Vancouver Business Journal. 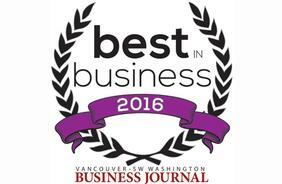 Your customers, vendors, employees and our readers picked your business as the best in your category. In total, nearly 3000 votes were cast for businesses in more than 80 different categories. Our readers represent a wide breadth of Southwest Washington’s business community – from lawyers and engineers, to retail store owners and marketing professionals. The fact that they chose to recognize your business says a lot about your level of service and quality. Best wishes for continued success in 2017. We look forward to seeing your company as a repeat Best in Business winner next year. Congratulations Copper Creek Homes! You are in the top 5 nominees for Best NEW HOME BUILDER in Clark County 2016! Your loyal clients and associates are voting for you - a great honor! Voting begins this Monday, February 15 - February 26. Winners will be announced in the Best of Clark County magazine publishing on Wednesday, March 23. 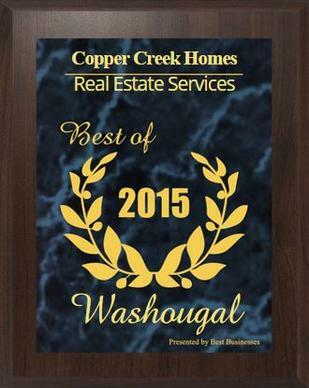 Washougal, September 17, 2015 — Copper Creek Homes has been selected for the 2015 Best Businesses of Washougal Award in the Real Estate Services category by the Best Businesses of Washougal Award Program. Each year, the Best Businesses of Washougal Award Program identifies companies that we believe have achieved exceptional marketing success in their local community and business category. These are local companies that enhance the positive image of small business through service to their customers and our community. These exceptional companies help make the Washougal area a great place to live, work and play. Various sources of information were gathered and analyzed to choose the winners in each category. The 2015 Best Businesses of Washougal Award Program focuses on quality, not quantity. Winners are determined based on the information gathered both internally by the Best Businesses of Washougal Award Program and data provided by third parties. The Best Businesses of Washougal Award Program is an annual awards program honoring the achievements and accomplishments of local businesses throughout the Washougal area. Recognition is given to those companies that have shown the ability to use their best practices and implemented programs to generate competitive advantages and long-term value. The Best Businesses of Washougal Award Program was established to recognize the best of local businesses in our community. Our organization works exclusively with local business owners, trade groups, professional associations and other business advertising and marketing groups. Our mission is to recognize the small business community’s contributions to the U.S. economy.